We all have clothes we could get rid of in our wardrobes/lofts/drawers and one persons rubbish is another treasure so selling on eBay could be a great little earner to fund some new pieces or to pay off a bit of debt. I have a strict one in one out policy - if I buy an item of clothing I sell something to fund it. But I also have periodic clear outs - usually at the beginning of a season where I drag a big storage bag out of the loft and brutally reject anything that I'm not so keen on anymore or stuff that just doesn't look as good as I remember it looking. I've become quite methodical about selling on eBay and also pretty successful - I can make a good few hundred quid just by getting ten items up. 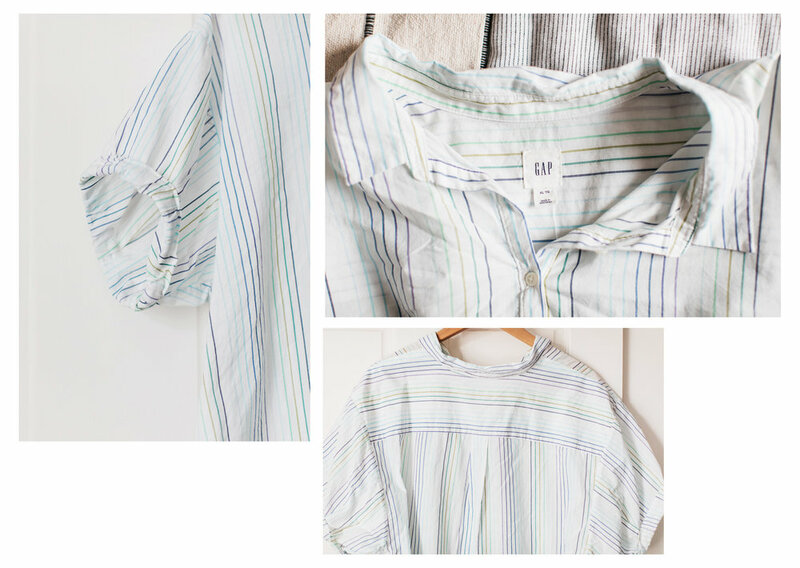 Recently I sold a batch that gave me a budget to hit the John Lewis sale and I came out with four outfits that I love, mostly in linen and by shopping smartly I'll be able to wear them across all seasons. Since then I realised I love my new outfits so much that I wasn't wearing a lot of other stuff in my wardrobe so I'm currently selling that. My point is, if you think you don't have money for some wonderful new clothes, think again! There are a few simple things you can do to make your ebay listings more attractive and the process easier. Phone pictures will be more than sufficient but you need the right light (we'll talk about that in a minute) and a clean camera lens (just give it a wipe - a simple step that will make all the difference for crisp images). Don't be tempted by filters and we're not looking for the most creative images here - keep the images simple and bright. Also, keep consistency, just like you like to see from your favourite online shop you want to keep a style throughout your listings. Where possible hang clothes on a nice hanger (I always use wooden ones) and place near a window - a wardrobe door with a window infront or to the side is perfect. Or hang from a (emptied) coat stand in front of a window. If the light isn't great in your room hang your items from a external doorway - and trust me, turn that flash off, a flash is a great way to kill a picture and make it look stark and uninviting. Clear the clutter! You are looking for an image where it is obvious what's for sale and the eye isn't distracted by anything else. Likewise, try to have a bit of white space but you want your garment to be taking up most of the frame. Don't be tempted to lay things on the floor unless you have good light and can get above it - things look so much better hung but if you want to show the shape of something - wear it and do a nice mirror selfie (keep that flash off!). Take some care with each item - make sure it's hanging straight and roll up sleeves/cuffs to show a bit of imagination. Also photograph any flaws - rips, tears, stains and loose stitching. I also find people love to see photos of labels and the backs of items. Don't forget to include interesting details too - nice flared sleeves or some contrasted stitching. As you photograph each item, keep a notebook with you and take as many details as possible - measurements, what the material is, any flaws to note etc. Be as thorough as possible with measurements - for trousers take an inside leg and a waist measurement (people will ask you for it as sizing can differ so much from brand to brand) and for tops take a shoulder to bottom hem measurement but also armpit to armpit. Trust me - providing these details will save you a lot of time in the long run (by not having to deal with endless questions and digging items out to measure) and increase your sales as the information people need is there without any hassle - make it easy for people to want to buy your stuff. Remember that you will need to keep everything crease free for sending out so fold and make neat piles to store somewhere and keep anything that is likely to crease hanging. Once you've taken the photos and made your notes head to the computer to make your listings. I always sharpen and brighten the images a little before using - you can do this on your phone and use airdrop or Dropbox to transfer to your computer. I prefer to do the listings all in one go rather than listing on the phone as you photograph as I can make sure they are all ending at a similar time. There's two factors to consider when deciding when to list/end your items: is the auction ending at a peak buying time and will you be able to post out within a few days at the most? I've found that auctions that end on a Sunday or Monday evening are by far more successful than those ending in the day or mid week. I usually list my auctions on a Sunday evening but if I need to do it another time you can schedule the start time or choose a 10 day auction instead of 7 days. You will have to remember to do this for each auction listing as you work through. I always go for an auction when listing multiple items and never a fixed price unless I know specifically what I would like to get for an item. If I'm listing just one item I might add a fixed price as well as auction but for ease I like to just send batches to auction. I also don't accept offers as I find allowing an auction to end is more fruitful. Include as much information as possible in your listing and keep your grammar and punctuation on point as this is a major factor in people taking your listings seriously and keep an element of trust. To avoid any time wasters I am as transparent as possible and state this in my listing. I list flaws, marks, bobbling and anything like loose stitching around pockets/waists etc. I also state that I don't accept returns for any issue that has been detailed in the listing. I've had people try and blame something I've stated clearly when its probably just that the item didn't suit them and they wanted to return. Keep the title clear but include sizing, brand and colour. In the body of the listing use wording to inspire and to make the buyer feel like they will get wear out of the item. I like writing things like 'perfect on its own for summer days or will go over jeans and match with a soft knit for the colder months.' Or... 'great trousers for a smart look with a blouse, heels or boots or dress down by rolling up bottoms and wearing with trainers and a tee'. I always mention on the end of every listing that I have other items for sale and can combine postage - I just keep it pasted on clipboard and add it in. I always go for second class postage - this keeps the cost down for your buyers and again, makes your item more attractive. When the auction ends it important to be ready to send your items out, you want good feedback and to encourage people to buy from you again. eBay has made postage really easy by allowing you to buy labels so you don't have to queue at post office and hold up the seething people behind you! All you need is a printer and some kitchen scales. I keep in a pile of tissue paper and some simple brown packaging paper. I have found this to be the most cost effective way of packaging and also it looks attractive and is kinder to the environment than plastic mailing bags. I also love this biodegradable tape. Take it from experience, you can easily forget about these and be stung! Once you have received payment for everything and sent it all out you can check your next invoice and you'll need to just keep that money in Paypal when you go to withdraw it. So go forth and eBay! Once you get into a rhythm you'll always be grateful for a bit of wiggle room in your closet and never getting that feeling of guilt for buying something new.